"Filled with a Power Beyond Ourselves"
Note: You may download this sermon at no cost, for personal use or for use in a Christian ministry, as long as you are not publishing it for sale. All I ask is that you give credit where credit is due. For all other uses, please contact me at mark@markdroberts.com . Thank you. On the day of Pentecost, seven weeks after Jesus' resurrection, the believers were meeting together in one place. Suddenly, there was a sound from heaven like the roaring of a mighty windstorm in the skies above them, and it filled the house where they were meeting. Then, what looked like flames or tongues of fire appeared and settled on each of them. And everyone present was filled with the Holy Spirit and began speaking in other languages, as the Holy Spirit gave them this ability. Godly Jews from many nations were living in Jerusalem at that time. When they heard this sound, they came running to see what it was all about, and they were bewildered to hear their own languages being spoken by the believers. They were beside themselves with wonder. "How can this be?" they exclaimed. "These people are all from Galilee, and yet we hear them speaking the languages of the lands where we were born! Here we are-Parthians, Medes, Elamites, people from Mesopotamia, Judea, Cappadocia, Pontus, the province of Asia, Phrygia, Pamphylia, Egypt, and the areas of Libya toward Cyrene, visitors from Rome (both Jews and converts to Judaism), Cretans, and Arabians. And we all hear these people speaking in our own languages about the wonderful things God has done!" They stood there amazed and perplexed. "What can this mean?" they asked each other. But others in the crowd were mocking. "They're drunk, that's all!" they said. When I was growing up a the First Presbyterian Church of Hollywood, Jim Ferguson was a living legend. As the church's youth director, he had led literally hundreds of kids to Christ, while inspiring dozens to enter full-time Christian ministry. An engaging preacher and solid Bible teacher, Jim helped young people grasp the meaning and life-changing implications of God's truth. But Jim was also, shall I say, adventuresome. A critic might even suggest that he was a bit of a loose cannon. You see, though he lived by the highest ethical standards, Jim was also a trickster. He did things in youth ministry - and got away with them, I might add - that boggle my mind. For example, one time Jim was taking a bus filled with high schoolers up to a ski retreat at Mammoth. (He was good friends with Dave McCoy, the founder and owner of Mammoth Mountain Ski Resort, so he could get the whole load of kids free lift tickets!) As they were driving up a long, boring stretch of Highway 395, Jim decided it was time for a little fun. So he waited for an especially deserted stretch of road. When he came to a place where there was nothing around but empty high desert, Jim pulled out the choke on the bus. Soon the engine flooded and sputtered to a stop, right in the middle of the highway. 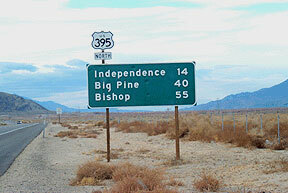 US 395: There's not much out there. Jim announced that they had run out of gas, and that they'd have to push the bus to the next town. So all of the high schoolers exited the bus and went around back to push. As the bus started to roll, Jim shifted into second gear and quickly let out the clutch. The bus's engine burst to life, and Jim pushed the accelerator pedal to the floor. He sped off, leaving the high school kids in the middle of Highway 395 in a cloud of diesel exhaust. You might wonder why I've told this story, especially if I'm not recommending that my youth staff imitate the prankstering part of Jim Ferguson's ministry. Well, this crazy story actually helps to illustrate the point of our passage today from Acts 2. You see, the church of Jesus Christ, and any particular church within it, like Irvine Presbyterian Church, for example, is rather like Jim Ferguson's bus. It's big, cumbersome, and pretty difficult to get moving. 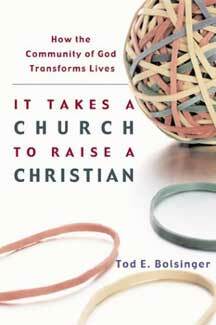 If you get everybody in the church to get behind it and push, so to speak, you can actually move the church forward a bit in its God-ordained path. But the effort will be maximal while the result will be minimal. Yet, on the other hand, when the church is moved by the power within it, then it will roar off in glory. The church wasn't meant to be pushed with human effort alone, but with the power of the Holy Spirit, the very power of God. Acts 2 chronicles what I've often called "the church's birthday." I don't mean the anniversary of the church's birthday, but rather the very day on which it was born. Prior to Pentecost there were a few followers of Jesus gathered together in Jerusalem, but they weren't yet the true church. On Pentecost, however, the Holy Spirit fell upon them, empowering them and binding them together as the new people of God. With power from the Spirit, Peter preached his very first sermon, and three thousand new believers were baptized into the brand new church. Not a bad start, really, especially for a novice preacher. Actually, this would be a phenomenal result for the finest preacher on earth. But Peter shouldn't get most of the credit, because he was operating, not in his own strength, but in the power of the Spirit. When the followers of Jesus, upon being filled with the Spirit, begin praising God in a variety of languages that they had not learned in the ordinary fashion, the onlookers are astounded. Some are skeptical, of course, accusing the disciples of being drunk. But Peter rebuts this explanation, claiming that it's too early in the morning for drunkenness. Rather, he explains that what's happening to the followers of Jesus is really a fulfillment of Old Testament prophecy. Through the prophet Joel, God had promised that one day he would pour out his Spirit upon everyone, men and women, young and old, even upon mere servants. In the era of the Old Testament, the filling of the Spirit was usually reserved for certain special people, for kings, and priests, and prophets. Average Jewish folk, though included in God's covenant, weren't filled with the Spirit. But, God, through Joel said that one day things would be different. And that day was Pentecost. What happened at Pentecost, though unique in the details, was not a one-time thing, however, but the beginning of a new era in God's work in the world. Even as the Spirit came upon the faithful followers of Jesus in Jerusalem, so the Spirit would be given to all future believers in Jesus. Though not everyone would experience the phenomena of Pentecost - tongues as of fire and speaking in other languages - the spiritual reality of Pentecost would touch everyone who put his or her faith in Jesus Christ. [Y]ou are not controlled by your sinful nature. You are controlled by the Spirit if you have the Spirit of God living in you. (And remember that those who do not have the Spirit of Christ living in them are not Christians at all.) Since Christ lives within you, even though your body will die because of sin, your spirit is alive because you have been made right with God. The Spirit of God, who raised Jesus from the dead, lives in you. Now that's pretty clear, isn't it? Scripture teaches that all Christians "have" the Spirit, if you will. The Holy Spirit dwells within each believer. But, nevertheless, there are times when we live in our own strength, failing to rely on the power God has given to us. There are other times, however, when we open ourselves more fully to the Spirit's work in us and through us. In these times the we minister, not in our own strength, but in the very power of God. The Bible refers to these experiences as the filling of the Spirit. Scripture teaches us to seek the filling of the Spirit. Ephesians 5:18 reads: "Do not get drunk with wine, for that is debauchery; but be filled with the Spirit" (NRSV). The Greek imperative "be filled" makes it clear that this isn't a one-time thing, but rather an ongoing experience. Paul is saying, "Be filled and keep on being filled with the Spirit, again and again." So, sisters and brothers, here is the punch line: If you have put your trust in Jesus Christ as your Lord and Savior, then you have received the indwelling presence of the Holy Spirit. So, live your life, not in your own strength, but in the power of the Spirit. Open your whole life to God, so that the Spirit might fill you and use you to do great things for God. God wants you and me to be filled with a power beyond ourselves, the power of his own Spirit. I'd like to ask you some personal questions, if I may. What would happen in your life if you really believed this? Really? Not just when you're sitting in church, but when you're getting up in the morning, and when you're doing your job, and when you're facing challenges too big for you to handle, and when you're trying to serve the Lord in the church and in the world? What would happen if you really believed that the power of the Spirit was readily available to you? I'll tell you what would happen. Your life would be forever changed. You'd see God at work in and through you as never before. You'd marvel at what God would be able to accomplish in your life as you learned to operate in the power of his Spirit. You'd find that you no longer have to push the bus of your life by yourself, because God is empowering you to do it with his strength. I have a prayer for each one of you, but it's not mine. I've taken it from the first chapter of Paul's letter to the Ephesians. Are you ready? Here it is: "I pray that you will begin to understand the incredible greatness of [God's] power for us who believe him. This is the same might power that raised Christ from the dead" (Eph 1:19-20, NLT). There it is. My prayer is that you will truly know the "incredible greatness of God's power" for us who believe, that you will experience the power of the Spirit at work within you each day, that you will be filled with the Holy Spirit. Now you may be wondering, "So what would this look like? What difference would the Spirit really make in my life?" Let me share one story that helps to bring the point I'm making to life. When I was an associate pastor at Hollywood, I had a friend named Esther. Esther was fine upstanding woman of around seventy years old, a faithful wife and mother, and an elder in the church. One of Esther's ministries was to call people who had visited the church and to welcome them. Before Esther made her calls, she always prayed that God would guide and use her. One day Esther called a woman who had filled out one of the visitor cards. As they began a casual conversation, all of a sudden Esther had an idea that seemed as if it might have come from the Holy Spirit. The problem was that this idea was not the sort of thing one brings up in a casual conversation with a first-time visitor to church. But Esther decided to take a risk, and said to the woman, "I need to share something with you that may be completely off the wall. If so, I'm sorry. But I need to be honest. As we were talking, I got an idea that I think might be from God. Then again, it could just be my imagination. Only you will know the truth. So here's the idea: I think you came to the church because your marriage is in deep trouble, and you are desperately looking for God to help heal your marriage. So, there's my idea. What do you think?" For a long time there was no answer on the other end of the phone. Esther began to berate herself silently, "You fool! Now look what you've done. You've offended this poor young woman. Now she'll never come back to church." But then, in a quiet voice, the woman finally spoke, "You're absolutely right about why I came to your church. But I was too afraid to tell anyone the truth. I do need God to help me in my marriage. That's exactly it." Well, you can imagine how this opened up an opportunity for Esther to minister to this woman, not only in one phone call, but in a new relationship. This is one tiny example of what happens when we minister in the power of the Spirit. In fact most of us have experienced something like this at one time or another, we just didn't know what was going on. Perhaps you were teaching Sunday School and a child asked a really tough question for which you had no answer. But then, all of a sudden, an answer came to mind that was just perfect. You thought, "Wow! I'm pretty good!" But, in fact, you should have thought, "Wow! The Holy Spirit is pretty good! Thank you, Lord!" Or maybe you experienced something like this when you were sharing your faith with a friend. She asks a tricky question, and all of a sudden you remember a Bible verse, reference and all, as if it dropped from heaven. Well, in a sense it did drop from heaven, though it would be more accurate to say it welled up within you through the indwelling Spirit. I cannot begin to tell you how many times I've sought for and received this sort of help from the Holy Spirit. Every time I sit down to prepare a sermon I pray, "Lord, help me. Show me the truth in this text. Help me to say what you want me to say." I know that the Holy Spirit helps me all the time. Or maybe I'm in a meeting and we're dealing with a tricky issue. I'll whisper a silent prayer, "Lord, what do you want us to do here? What is your will? Please speak to us. Guide us." Sometimes the Spirit's help will come in the form of gifts of knowledge or wisdom through me. Often it will come through others. My friends, if you believe that God's Spirit lives within you, and if you allow the Spirit of God to fill you, you will do great things for God, by his power and for his glory. I'd like finish up this sermon by asking us all some questions about our church, if I may. What would happen in this church if we really believed that God's own Spirit dwells in and among us? Really? Not just when we're sitting in church, but when we're getting up in the morning, and when we're doing our jobs, and when we're facing challenges too big for us to handle, and when we're trying to serve the Lord in the church and in the world? What would happen if we really believed that the power of the Spirit was readily available to us in this church? I'll tell you what would happen. Our life together would be forever changed. We'd see God at work in and through us as never before. We'd marvel at what God would be able to accomplish in our church as we learned to operate in the power of his Spirit. We'd find that we no longer have to push the bus of this church by ourselves, because God is at work in us, giving us power far beyond ourselves. I'm thrilled with what I see happening in our church these days as the Spirit of God is moving us out more and more into the world. As never before, we are living out our mission in this city and throughout the world. But, my friends, God has only begun with us. There is so much more that he will do as his Spirit is unleashed in us. My "pushing the bus analogy" has a major flaw, I'll admit. In my story about Jim Ferguson, the high schoolers were pushing the bus, but the power of the engine was external to them. In the church of Jesus Christ, the power of the Spirit isn't outside of us, but within and among us. My story would have been perfect if, instead of the engine starting up, all of the kids were suddenly given supernatural strength, and were able to push the bus at top speed down the road. But if I'd told the story this way, I don't think you'd have believed me. Besides, it wouldn't have been true. So I hope you understand that God will move Irvine Presbyterian Church forward, not by the power of some mysterious engine, but by the power of the Spirit at work in you and in me and in our fellowship together. I pray today, in the language of Ephesians 1, that we will come to understand the incredible greatness of God's power for us. Moreover, I urge you, in the language of Ephesians 5, to be filled again and again with the Spirit. Make yourself available to God. Open your life to him. Offer your body to him. Let him melt you, and mold you, and fill you, and use you. We need it now more than ever!